publication some time in 2015. While the MANTULA story has been plotted for some time, I didn’t know where the tale would lead when I began writing it last year. Since starting Doug’s journey, I’ve moved from Sedona Arizona, and my job as reporter with Prescott’s daily newspaper, to my birth territory in California’s Monterey Peninsula and a wonderful new job at the local natural history museum. This change in circumstance may show in the pages of the story, but the story itself continues. 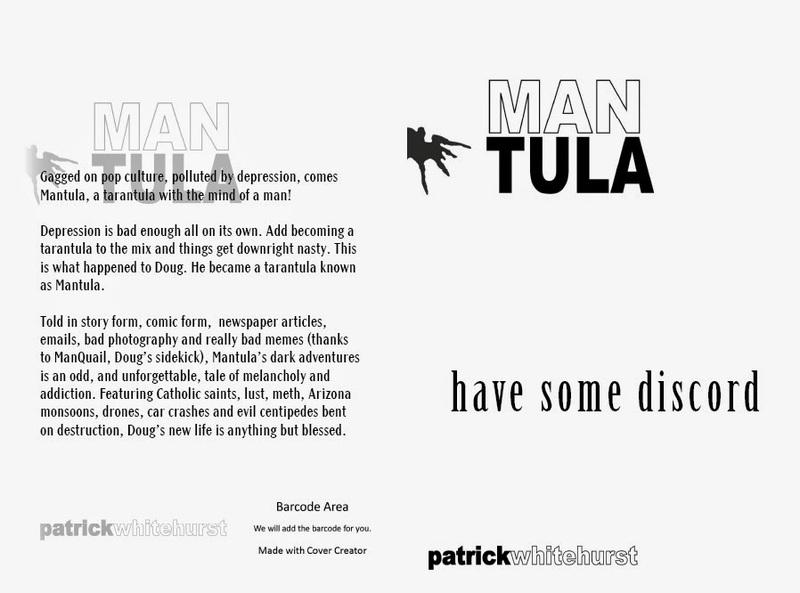 What many don’t realize is that MANTULA is an effort in free-form writing. It’s an urban fantasy, full of curses and situations beyond the realm of mortal men. Every drop in the bucket creates a great sea, furthering the story, from the comics to the news articles (the memes not so much, but they’re awesome); each make a link in the literary chain. It’s an unedited, raw story, posted online as each part is written. For MANTULA, I edit once as I write, then it’s thrown online. Further editing will be found, including rewrites, prior to self-publishing the final, finished novella. For me it’s been an exercise in bare story-telling, in producing a story anyone can read, free of charge, in a writing environment where the emphasis seems misplaced. The story itself, the fun and excitement of imagination, seems lost in a world of marketing, sales, and Twitter followers. For this project at least, my hope is to do something where those cares are erased and unnecessary. MANTULA is for me, for my family, and for fun. Besides asking my son to contribute to the story via drawn images, the spark of creativity has also been stimulated in our shared MANTULA projects, such as the creation of YouTube videos featuring our spidery main character. It’s been a fun year of creation so far, and will undoubtedly continue when MANTULA is a project of the past. That’s if I leave him alone.